A good example of a horse that should be black, but has the typical ‘bleached’ look to the coat and mane. The coat is very rough looking and shedding in patches instead of smoothly. This to me would be a fairly extreme bleaching, indicating the horse is really deficient (as an auction horse, not surprising). Many well cared for horses have much subtler signs of bleaching or coat issues, or no coat issues at all and the hooves show issues instead. While milk may or may not do your horse’s body good, iron for sure does it no good. At least in excessive amounts. 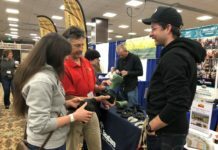 The problem is, that many horses are getting excess iron, and the side effects are numerous (most easily seen in barefoot horses, as the hooves are one of the first things to suffer under excessive iron and the resultant imbalance in other minerals). From bad hair coats and hooves, to insulin resistance and immune/allergy issues, iron overload is a major problem, that I think is being majorly overlooked. Iron is being added to almost all processed feeds and vitamin/mineral supplements, when our horses get too much naturally already. The following is a kind of cliff notes version about the importance of mineral balancing. There are many articles out there if you google “equine iron overload” and “equine mineral balancing”. A horse’s daily need for iron is estimated to be around 40ppm of their entire ration (hay, grain, grass, water, whatever..and don’t forget, many lick and eat dirt, or pick it up while grazing. This also adds some. Most horses get many more times that. A great place to start, is to figure out your iron levels in your area. This link: mrdata.usgs.gov/geochem/doc/averages/countydata lets you check up on most of the important minerals by each county in the US (likely if you are outside the US, there will be an equivalent to the USGS in your country, or even a county/state agricultural extension office, that might have this info for you). My county (Humboldt, on the far northern California coast) comes up fairly high, at 4.197. mrdata.usgs.gov/geochem/county.php?place=f06023&el=Fe&rf=northwestern. This then transfers into the grass, hay, and water your horse consumes (and even our import hay from Oregon and inland CA is fairly high). In our coastal area, it is even worse. Iron uptake into plants is higher in a) water saturated soils (we can get 6-8 months where it rains, and fog the rest of the year) and b) soils with higher acidity (our soil is definitely acidic). Ok, double doom. If you want a truly accurate count of what your horse takes in, you would have to take samples of your pasture (if they have pasture), soil (remember, they often lick or even eat dirt, and at least pick it up while grazing or eating hay off the ground), water, and anything else you feed (like I feed beetpulp, which is supposedly very high in iron, as well as a hay-based pelleted feed, and rice bran). This is the only sure way of determining the iron and other mineral content your horse is getting. There are hair and blood tests you can do, but iron storage in the horse is fairly complex, and these tests are not always an accurate picture of what is going on in the horse. This of course could get expensive, particularly if you can not get large loads of hay that will last most the year, or change pastures a lot. 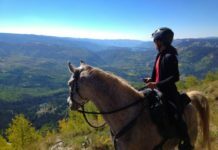 What is a horse owner to do? First off, do not add iron. As much as possible, do not feed extra iron. It is almost unavoidable if you are feeding a bagged feed of any kind, but stay away from mineral/vitamin supplements that have added iron. Read the ingredients lists: both the nutritional breakdown and the ingredient list, and never feed high iron supplements like Red Cell unless your horse suffered a lot of blood loss or otherwise had a vet prescribe it for a good reason. 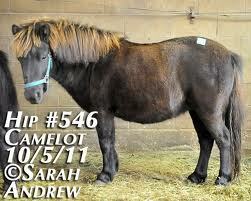 Severe iron overload will actually mimic anemia, and thus make it look like a horse needs more iron. Feeding more iron will thus just worsen the issue. Also, get rid of all salt/mineral blocks that are not pure salt. All those red streaked/colored rocks and blocks? Guess what color iron turns when it oxidizes? The same goes for selenium, sulphr, and other mineral blocks. Horses can not get enough salt out of a lick that was designed for a cow tongue anyway. Best to top-dress their feed (or even hay) with salt, then feed a mineral mix. If you must put a lick in their pen/stall to play with, just toss in a white block please. What else? Again, read labels. If you are buying bagged feed, many of the brands now all make mixes that are fairly similar to one another: senior mixes, performance, low sugar, or whatever it is you want. Compare labels and see what has a lower iron level for what you need to feed. Call the companies! Maybe if more of us ask why they all are adding iron when it is not needed, they will stop doing so. We now have low sugar/starch feeds, because owners demanded it. We can also demand low iron and higher copper/zinc contents. And when that fails, find a good mineral supplement that adds a lot of extra zinc and copper. Living in California, I use California Trace, which also has added selenium that is lacking in the West, as well as other good things like Vitamin E. There are some other good, regional products like AZ Copper Complete. If you can not find one in your area, both these have done fairly well in many other areas of the country as well, though you should talk to an equine nutritionist to make sure it is appropriate for yours. CA trace may contain too much selenium for high selenium areas for example. This horse shows bleaching in the face hair, as well as the forelock, and the ‘hooked/split end’ look to the forelock hair. Often, even if you don’t see bleaching, like in a chestnut or lighter colored horse, you will see this fraying to a horse’s hair. If you look really closely at the coat hairs, you can see them ‘hook’ up and not be smooth. 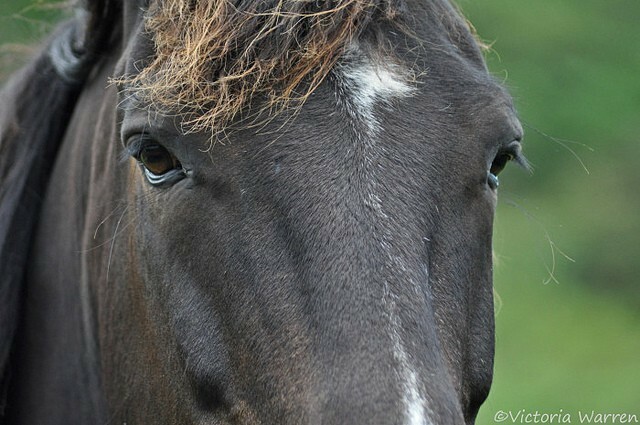 This is often what gives a horse that dull coated or rougher coated look. 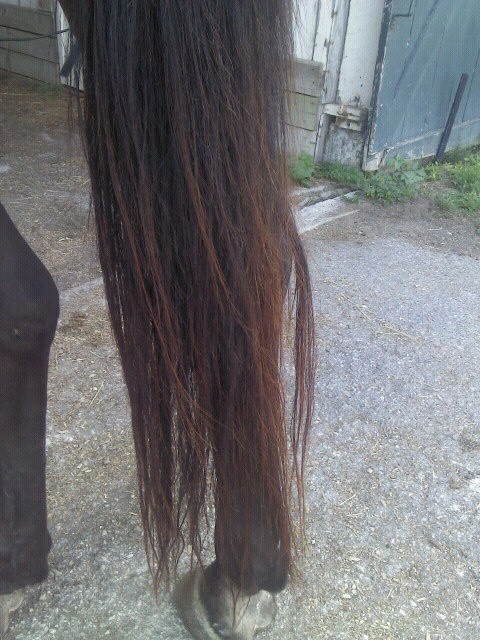 A sun bleached tail on a dark horse, hair also looks rough. Hoof wall cracks are not in the white line itself usually, alhough they can transfer into it. You can see the white (yellow) line on the inside of the cracks, and from the outside, the walls on these horses will look relatively normal, with no external cracks. Most times the problem is not this severe, but many horses have some cracks like this, that just will not go away with trimming. Does you horse have thrush and/or white line issues that will go away, even with great hoof care and topical thrush treatments? Does your horse suffer from sensitive hooves, even though they look great from the outside and have good trims on them? Does your horse have issues tolerating sugars (but does not test for insulin resistance) or is even insulin resistant? Does your horse have scruffing/flakey skin and is itchy all the time, even when not sweating and with feeding flax and good grooming? Does your horse eat a lot of dirt, eat tree bark, branches, bushes, other ‘odd’ plants, even though it has tons of food and isn’t bored? Does your dark colored horse bleach out every summer, does your horse have a ‘dull’ colored coat, have frizzy ended hair, etc? Does your horse suffer from allergies or other immune issues? 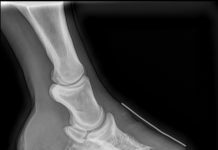 Does it suffer from unexplained laminitis (or has sugar sensitivity related laminitis), blow abscesses for no reason, has thin soles, etc? 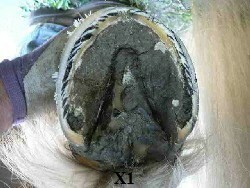 Does your horse have cracks in the outer hoof wall, cracks in the inner wall between the white line and sole, bad hoof quality in general? All these things can be, and often are, related to a mineral imbalance. Most often this is from excess iron, as it causes a copper deficiency and other issues in the mineral balance. Balance the minerals back out, add extra copper (needed for good hoof an coat development for one) and extra zinc. They sell zinc lozenges in the drug store for a reason: they are a great immune booster and you and your horse need zinc for good health. Iron overload has been directly linked to insulin resistance in some studies. It is also a known cause of inflammatory and immune issues. Sure, you won’t magically make a serious condition in your horse go away by balancing minerals. But it often clears up all those small, nagging things that drive horse owners nuts. That dull and itchy coat, the thrushy hooves, the sensitive feet. if sugar levels are watched of course, minerals will not miraculously let your horse pig out on pasture or grain. Next articleSpring Cleaning, Amateur Trimmer Style.